What is a keyword tool? Before answering the question, I need to make sure that you understand what “keyword” is. Keyword? What is a keyword? A keyword is a word or phrase that is the main theme of an article that you create for your website. Look at the title of this article; “What Is a Keyword Tool?” It is what I am going to talk about and hence, the “keyword” of this article. Finding a good keyword is fundamental for your ranking in search engines such as Google. Your article needs readers, right? Where are those readers? They are online searching for information or solutions. As an online entrepreneur, you have to write to help those people. How can you help them if you don’t know what information they need? People would perform a search under phrases such as “how to heal a headache quickly,” “best sushi restaurant in Portland,” or “making money online scams.” Those are all keywords and tell you what information people are looking for online. Understanding a keyword, you can write to provide valuable information for your readers. What is a “Keyword Tool” Then? Well, the name is quite self-explanatory but it is a tool that helps you to choose the most “effective” keyword for your articles. Contents are the core part of your online success because that’s what attracts your visitors (customers). People would come visit your website because they find valuable information on your website. But first and foremost, they need to know that your website exists, right? Here, a keyword comes into play. People would discover your website when they perform an online search under the keyword you have written a content for. Therefore, a “good” content has two elements. It provides valuable information in-depth. It has a right keyword in its title, and a few places within the content. And a keyword tool gives you the data, such as search volume, to help you select a right keyword for your content. Before we get into the keyword tool discussion, let’s talk about content strategy. First, you must brainstorm as to what your content is going to be about. Ask yourself “What phrase would best describe my content?” “When people search this query, what information are they looking for?” Then, write down any phrases that come into your mind. I will give you an example. Let’s say your website is all about beauty tips for women. Today you want to write a blog post about facial wrinkles and how to reduce them. Which one do you think will best resonate with your target readers? Should you choose the one that sounds right to you? You have to figure out which one works best for your website based on certain data. But at the moment, let’s not worry about the effectiveness of each keyword. We are still gathering candidates. Just jot down all the phrases come to your mind. Later on in this article, I explain how a keyword tool helps you select the best one for your content. Let’s keep on with a bit more research. You can go to the Google search bar to find out. Google now has implemented in its search engine a new function called Google Instant (or, Google Suggest). What is Google Instant? Well, have you noticed that the Google search bar gives you the drop-down phrases related to what you just typed in? Those are real-time keywords that people are actually searching for. This new feature of displaying them instantly is called Google Instant. As an experiment, I typed the phrase “how to reduce wrinkles” and below you can see what Google Instant gave me. The drop-down listed three more phrases, such as “how to reduce wrinkles on neck” and “how to reduce wrinkles around eyes.” They are actual phrases that people have used. Generally speaking, the more specific the keyword is, the less competition you will have. Hence, a better ranking for the keyword. You want to bear this in mind especially while your website is still quite new. So, if you have a good knowledge to write on a more specific topic, it’s better to do so. In this particular case, you will have less competition if you write about how to reduce wrinkles on neck or forehead (specific parts of the body) rather than reducing wrinkles in general (boo broad). OK, I added more candidates to our keyword list. I found all those additions (in red) via Google Instant. It’s time to select the best one! We currently have 11 possible keyword phrases… Which one do you think most effective and get better rankings on Google search? We want a good ranking so that people would find our article easily and come visit soon! At this stage you need to look into two aspects of each keyword: Search Volume and Competition. Search volume is the average number of people per month, who is searching for that particular keyword. Competition means the number of websites out there that have contents (article/blog posts) for the keyword. The keywords with higher search volume naturally are in proportion to more competing websites. Therefore, what we want to aim here is a keyword with a decent search volume (more than 100) and relatively low competition (less than 300). We call such keywords “Low Hanging Fruit” keyword. Imagine a fruit tree. Those fruits hanging low on the tree are typically smaller (less desirable, thus less competitive). But there are more of them and easier to catch compared to the bigger fruits on the top part of the tree (more popular, thus more competitive). 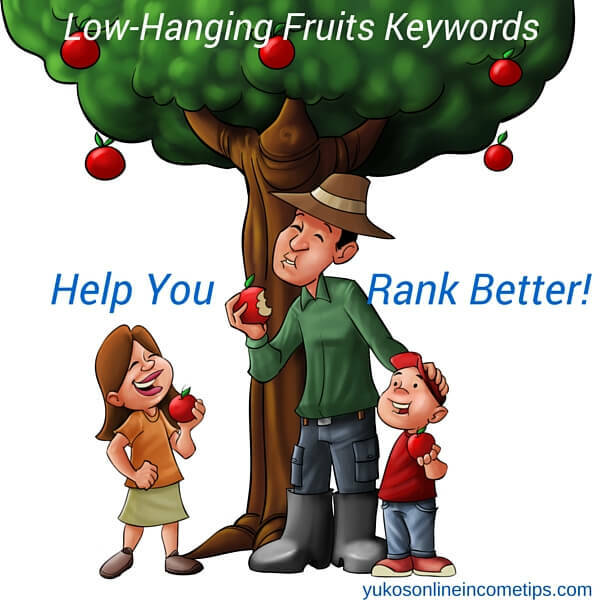 Our goal is to find those “Low Hanging Fruit” keywords. The ones with decent traffic and less competition, and you need a reliable tool to find them. A good keyword tool tells you instantly the two fundamental elements of keyword selection: the search volume and competition. The data is crucial for you to select the most effective keyword for your content. I have tried a few different tools but this is the best one: Jaaxy. It has been saving me hours on keyword research and helped my contents rank quickly. With Jaaxy, I can instantly gain all the necessary data, and it is just so fun to use! Again, our goal is to find an extremely targeted keyword related to the topic with a decent search volume and low competition, aka “Low Hanging Fruit” keyword. I typed in “reducing wrinkles” and see what I got below. Remember “Low Hanging Fruit” keywords? Decent search volume and less competition are what we want. Let’s spot them in the results below. At Jaaxy, the search volume is indicated as Avg (Average Monthly Searches) and competition is as QSR (Quoted Search Results). Avg = Search Volum more than 100. Let’s try another one. How about “Tips to reduce wrinkles on forehead”? Hmm…. the result shows the phrase has too small of a Search Volume. “Avg <10” means less than 10 searches per month. It’s simply not enough to bring traffic to our article post. We need to give up on this one as well. “Tips to reduce wrinkles on forehead” and “How to reduce wrinkles on forehead” practically mean the same thing, right? However, Jaaxy clearly showed us that, as a keyword (title), the latter is way more effective. However, Jaaxy clearly shows us that, as a keyword, the latter is way more effective. The colors you see under KQI (Keyword Quality Index) corresponds with the traffic lights. Green (good to go), yellow (caution) and red (don’t go). It helps you to visually identify good keywords right away. I always aim at the green light and it has been working wonderfully for my rankings. There are other valuable features on Jaaxy, which I covered in the full review. Want To Try Jaaxy For Yourself? Type in any keywords in the bar below and see what happens. Jaxxy is free to try out. It actually comes with 30 free searches for a starter! As far as I know, Jaaxy is the quickest, easiest and most powerful keyword tool existing. And it is an online tool. You don’t need to download anything. It is accessible from any of your devices, as long as you are connected to the Internet. 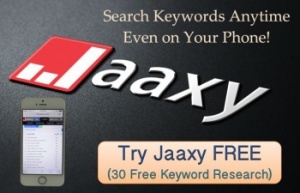 With Jaaxy, you can perform a keyword research even on your iPhone! It comes with 30 free keyword searches, along with other features that it has to offer. You can try Jaaxy for yourself before paying any money. Jaaxy Pro – $19/ month (or $199 per year). It comes with UNLIMITED SEARCHES for your keywords. It is also 2x faster than the Starter membership and offers a few tutorial videos when you sign up for Pro. If you are just starting out with one or a few websites, this is more than enough to assist you with keyword searches and SEO. Jaaxy Enterprise – $49/ month (or $499 per year). This is the most powerful keyword tool that you can ever find. It is even 10x faster in everything than Starter and Pro. 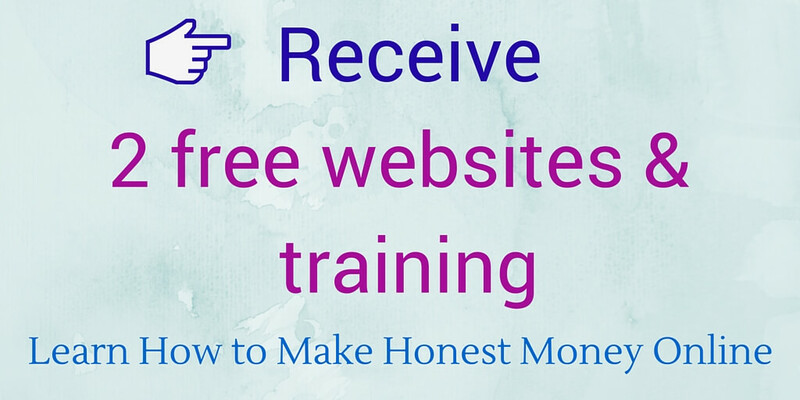 You will eventually need this version as you become an online business expert running multiple websites. Endless List of New Content Ideas! I hope now you’ve got the idea of what is a keyword tool and how it helps you with content writing. A keyword tool like Jaaxy can give you dozens of possible keywords for your new contents. It is vital for your content rankings in the search engines and overall success of your website. Here is a tip from me as you continue on as a website owner. If you find a perfect “Low Hanging Fruit” keyword but it doesn’t specifically describe the topic of the content you are about to write, take note of it for another content. Do not alter the current content for the keyword. You can write a separate article to work with that particular keyword phrase. You may be surprised to find yourself endlessly finding new topics for a new blog, every time you do a keyword search on Jaaxy. Lastly, I want to emphasize that we are writing for actual people and not for the search engines. Let’s not forget that. This is why I said not to use a keyword that does not exactly describe your content, even if it possesses a very promising data. I hope you enjoyed this article. Do leave any questions or comments below. If you have found a good keyword tool other than Jaaxy, please share with us. I would love to know! 42 Comments on "What Is a Keyword Tool?" Thanks for the sweet comment. 🙂 It’s nice to receive a confirmation that this article does help people understand what keywords are. Never thought that I would be qualified to do a training article at WA, but thank you. Perhaps in the future, I will think about doing it. Hi Yuko, this is a nice text on keywords and about Jaaxy. I have two questions. How would you compare Jaaxy with Wealthy Affiliate Keyword Tool? Another is, do you know about Long Tail Pro tool? It appears to be far less expensive, you pay only once $97 or so? Thank you. The keyword tool at Wealthy Affiliate also provides the two important data; average search and competition. It does not give us the color-coded keyword rank, which has fastened my searches, and related keywords on the side for brainstorming. It also does not take an apostrophe. What I mean is, it takes “what is…” but not “what’s…” So I prefer Jaaxy over WA tool. You’re an excellent teacher. I have been working with keywords for quite a while and have never understood the simplicity of keyword analysis until now. Just to know that search volume describes potential customers and competition describes other vendors. That concept is so simple and useful. I also like the way you led me right into Jaxxy’s signup page when trying out the free tool. This is a very nice site for beginners. Hi Stephanie,gWhen I first attempted to use a keyword tool, all the data and numbers confused me. I really didn’t know where to look at, to make the best out of it. So, remembering what I didn’t understand helped me to write this article. I am glad you found it helpful. 🙂 I hope it helps many newbies to understand how useful a keyword tool is. I now cannot even write a content without it! Thanks for stopping by. If Jaaxy were free, that would be the best! lol I too wish it was, but even with the monthly $19, (I use Pro version and it is more than enough for me) it is totally worth the money. If I were actually writing the example content about “reducing wrinkles on forehead” I would have chosen the headline “Tips to reduce wrinkles on forehead,” which doesn’t generate much traffic according to Jaaxy, rather than “How to reduce wrinkles on forehead” simply because the former sounds better to me! I admit that I didn’t use Jaaxy from the beginning and chose titles, headlines, and even the alt texts for images as I felt like. I didn’t understand how important keywords are for my ranking and didn’t really understand how to use a keyword tool back then. Once I began utilizing Jaaxy, I had to go back to all my articles and fix many of them! If you are serious about making money online, it is better to start using Jaaxy at an early stage of your career as an online marketer. Thanks for your comment Dominic. Good luck and let me know if you have more questions! Great explanation on why using a keyword tool is so important, and how by using one correctly, it’ll provide you with a whole bunch of additional great keyword ideas you’d have never thought of. I’ve recently upgraded to Jaaxy Pro and now I’ll never write another post without a good keyword search beforehand. You explain the usefullness of keyword tools in such a simple and easy to understand way. Thank you for your kind words. My content writing changed drastically since I registered for Jaaxy Pro as well. I was working on my contents without Jaaxy for a month and truly regretted that I didn’t make the use of it a lot earlier! It does make such a difference, doesn’t it? Great article about keywords! I am trying to build out a site and have been kind of stuck on the keyword process so hopefully this can help. When you are deciding on keywords, does the title creation process come to your mind at all or not so much? How do you go about creating engaging titles from the keywords you find? Hi Yuko and thanks for writing such a fine description of the keyword tool and its importance . You are an excellent teacher with an exacting method of explanation . I can only agree with all the previous comments and I would like to see more of your ” training ” articles . Continued good luck in the teaching profession as you are very capable in this field . Thank you for your kind comment 🙂 Teaching is what I am truly passionate about and I feel blessed to be able to do it here as well to help people help themselves. I’ll try my best to share what I know with my readers as often as I can. Thanks Paul for stopping by and best of luck to you too with your future endeavour! This is an excellent article about keyword research. I learned a lot from this post. I just recently started using Jaaxy and I have to agree with you that is the most usable keyword research tool available. Are you also using it to evaluate your website ranking? I find that feature one of the key difference that set Jaaxy apart from the competition. I am glad that this article served you well 🙂 Yes, I am using Jaaxy for website ranking too. Thank you for pointing that out. I should add that feature to the Jaaxy keyword tool review. Good luck with your online endeavor Tom! I am sure you will be successful having Jaaxy to support you. Great explanation of keywords and their use for websites. I have recently been looking at this kind of stuff so I think your page is very useful. I too have also started to use Jaaxy and couldn’t imagine trying to do this kind of research without it. Do you know if there are any other sites that do the same kind of thing? It’s great that you’re already using Jaaxy 🙂 I have used a keyword tool at Wealthy Affiliate and AffiloTools at Affilorama, but nothing compares the performance of Jaaxy. It’s super fast and easy to use. Just like you, I wouldn’t know what to do without having it by my side! When I first started my online business, I had no idea on what keywords were, let alone keyword tools! HA HA! I have discovered so much AWESOME information on keyword research, and Jaaxy simply looks like an Amazing keyword tool for me to start with. Thank you for commenting. I was exactly the same way! I didn’t know anything about keywords and I think I even posted a few blogs without any keyword researches on them. I had to go back to all those blogs a lot later to properly edit. I wish I started using Jaaxy from the very beginning. I tried another keyword tool and had to come back to Jaaxy in the end. I don’t know any other tools as efficient as Jaaxy. Highly recommended! Hi, I stumbled upon this site, which is amazing I must say! Such a useful and quality content and site layout overall . Very good written and easy to understand, especially for beginners. I will definitely visit your site in the future, thank you very much for sharing this knowledge and good luck. Thanks for the kind comment 🙂 I am in the teaching profession for many years so the experience might have helped with explaining things? I’m glad you find it easy to follow. Good luck to your online success! It has to be said, good keyword research is the essential foundation of any internet marketing business. There are so many great low competition keywords out there. It’s really just a case of finding them. Then if you write great content on these low competition keywords, you have a high chance of getting on page 1 of Google. If you keep doing that over and over again, over time it eventually adds up to a lot of targeted traffic to your website. That’s what it’s all about really. Thanks for summarizing what online business is all about. You are absolutely right! Contents with great quality with right keywords are the core of success here, and you cannot achieve the ultimate goal without the help of a good keyword tool. I’ve been using Jaaxy to find low competition keywords, and it has proved to help me quickly rank in Google. I wouldn’t have the success I have now without Jaaxy. I honestly recommend it to anyone who seek a success in the internet world. Thanks for a great article on how to find keywords and their importance in your content. This post will surely help many newbies better understand the process. You also explain very well what is a keyword tool and give a good tutorial on how to use Jaaxy. I have been using Jaaxy for a while and it really does make finding those low competition keywords quite simple. The free trial is something that anyone just starting an online business should consider. Glad you enjoyed the post and you enjoy using Jaaxy 🙂 It surely is designed with simplicity and efficiency, isn’t it? I enjoyed using it as a newbie and as I get more experienced in the online world, I began appreciating the value it provides even more! I truly like the fact that they let you try it first for free and get a feel of it. It’s always nice to get a confirmation of its effectiveness from a fellow user. Thanks for sharing your experience with Jaaxy. I am amazed by this post. Thanks for putting in your effort to come out with this great post to share with us. Finding appropriate keywords is essential for almost all bloggers. I have never come across a thorough post like yours here. There seem to be many ways / tools we could use to look for keywords. Jaxxy seems to be a great keyword tool! I am glad I can try Jaxxy for free. I will come back to this site again for sure! Jaaxy is wonderful to help you navigate through possible keywords for your post and find the one that get your article ranked. The 30-free keyword searches that Jaaxy provides is definitely worth a try! Well. That’s an awesome article covering all there is about keywords and keyword tools. I enjoyed the description and also your honest, clear review about Jaaxy. Very well done. I also liked the design of the website, the layout of the content and how you’re giving more life to the text by incorporating a nice formatting and adding relevant images. Greatly done. Keep up the good work. Wishing you the great success in the new year! I have my own website and I always try to generate traffic by creating good quality content. In order to do this I must find good keywords that will help me figure out how many people research that term and the competition. I came to the conclusion that keywords are the key to having a successful website. I will definitely try Jaaxy and tell you how it works out. Thank you for the information. I have been struggling with keyword research for a long time and only after I saw for which type of keywords I ranked, I knew that I was up to something. I also use Jaaxy and I generally aim for a QSR of less than 100.The longer and more specific the keyword is the better chance you have to rank for that keyword. Agree. Long-tail keywords have way more chances to get ranked quickly. If possible, I too normally go for a QSR less than 100. Interestingly, some of the posts I wrote under a keyword with a QSR more than 200, once they got ranked, are staying quite high in ranking and those are rather well-written articles (in my opinion) with a longer and more descriptive content. I guess Google sees the quality too. Thanks for commenting! This is the second article I’m reading on your website. The first was about Jaaxy if I remember correctly. As always you did a great job with this one as well. Very detailed and very easy to read. A pleasure going through each paragraph. Keep up the good work. Glad this post was an enjoyable read for you. Recently, I got asked questions by newbies what keywords are and how to find the best keywords for their websites. I think many newcomers tend to have a hard time understanding keywords, let alone a keyword tool. I can totally relate to them as I was once very confused. I hope this post helps many to get a good idea what keywords do for a website. Big post and a fantastic roundup. I found couple of new tools but my all time favorites are Ubersuggest and SEMRush which are great too. But now I’m thinking of exploring couple of new tools. Thanks for sharing this post and the resources. I’ve not used SEMRush but heard good things about it. I may need to look into that as well. Thanks for sharing your thoughts. Take a look at Jaaxy and let us know what you think. I would love to hear your opinions who have experiences with other keyword tools. Cheers! SEO is consistently a major driver of growth and customer acquisition for niche websites and full blown websites. Having a top keyword tool in place is paramount to getting this sort of technique right at the first time of asking – Good keyword research equals good eventual rankings! Is this (Jaaxy) your favorite tool by the way? I cannot agree more. No matter how awesome your content is, it loses its value if it is not ranked and discovered by online users. Thus far, my most favorite is Jaaxy perhaps because I started out as a complete novice and Jaaxy was not only helped with my content ranked but also incredibly easy to use. I know there are other tools that provide more complicated data but for newbies to intermediate users, Jaaxy serves wonderfully and gets the job done. Hi Yuko and thanks for the detailed post. I liked your idea about the low hanging fruit. I was thinking that it was too difficult to make keyword research. I will take a look on Jaaxy too. Are there any other tools that find the competition and give you content ideas? I’ve been using Jaaxy for all of my online marketing – blogs, video titles (YouTube), social media posts, etc. It has been doing all the jobs for me for the past two years and I don’t have the need to look for another tool. It’s very intuitive and easy to use. I highly recommend it!